Bovada was established in order to give American players who were accustomed to the high quality games at Bodog, a place to continue with their online gambling exploits. The plan was to provide the same high level of service that Bodog was well known in the online gaming industry for their delivery of online poker, sports betting, and casino games. 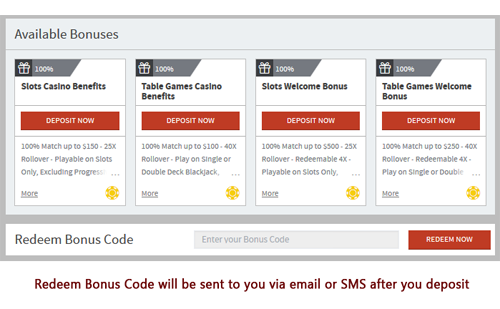 Bodog visitors will be right at home when changing their address to the Bovada.lv site, as it uses exactly the same interface with the same bonuses, games, and promotions. The current welcome bonus for new customers is 50% up to $500. If you are using bitcoins to make your initial deposit, make sure to use the "BVSBITCOIN50" promo code to receive the promotion. Any USA residents attempting to visit Bodog.com or Bodog.eu will be instantly redirected to Bovada.lv and given further instructions and information on how to proceed. Bovada is well known in the online sports betting trade and for good reason – they are consistently offering the finest that online betting has to offer, with the best odds available over a wide range of sports types and leagues. Explore further and you will also find that Bovada are also the most generous with their bonuses, customer service, and have available a huge range of deposit methods. Online players will find plenty of reasons to like Bovada as their online sportsbook given their reputation for quality. 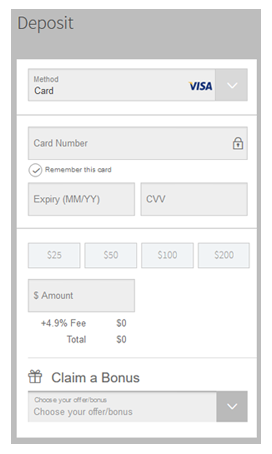 As Bovada is a US brand, players are able to use Visa credit cards for depositing with a high rate of success. **Updated in January 2017: below deposit options are currently not available. There is also a service listed under “Rapid Transfer” for gamers to take advantage of, which is actually MoneyGram. MoneyGram is a widespread service available in many locations, including just about every Wal-Mart and many gas stations, among others. For those who experience difficulty depositing via credit card and find it too inconvenient to travel to a physical location, there is still the option of using BitCoin. Bitcoin is one of the newest deposit methods added by Bovada to help players fund and withdraw their player funds from their accounts. USA residents have the option of either receiving a check via courier (generally takes a week), or they can make use of MyPayLinQ to gather the funds for later withdrawal. Visit www.bovada.lv to enter the Bovada Sportsbook betting service. A very thoughtful $500 maximum bonus reward per player. Players can get started with real money betting on as little as a $20 (minimum) deposit. The range of sports to bet on at Bovada is many and varied. As a major player providing a betting avenue for USA gamblers, Bovada naturally offer a relevant selection in NFL, college basketball, college football, PGA tour, NASCAR, tennis, MLB, NHL, NBA, and many more. The most popular bet types are straight bets, including against the spread, game total, the moneyline, and props or future wagers. There are more exotic bets in the form of parlay, teaser, pleaser, as well as an if-bet in any of the sports types that offer them.